Registration for Designers is NOW OPEN! Rock Your Rack is coming!!!!! I am excited! It’s the time everyone has been waiting for! 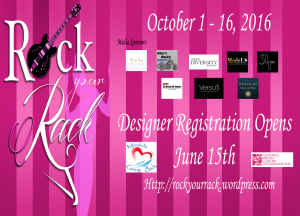 Designer Registration for the 4th Annual Rock Your Rack event presented by Models Giving Back is NOW OPEN! Click Here to go to the designer page for information on the packages available and the Link to Registration. Just a reminder – registrations will not be processed without donation information included. Confirmations will be sent after all information has been verified.